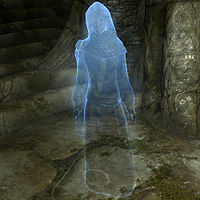 Elvali Veren is a Dunmer sorceress and a former college mage, who is encountered as a ghost multiple times within Labyrinthian, as impressions of past conversations with the Arch-Mage during The Staff of Magnus quest. She was part of an expedition into Labyrinthian along with her fellow students Savos Aren, Atmah, Takes-In-Light, Hafnar Ice-Fist and Girduin. She was the second to die, after Girduin, grabbed from behind as Hafnar explains. Elvali wears a set of blue mage robes with a pair of boots and carries a single red apple. Elvali first appears with her companions at the entrance to Labyrinthian, but does not speak. In the next chamber, you will see the mages again, preparing themselves. However, after their encounter with the skeletal dragon, Elvali becomes panicked by the loss of Girduin and wants to go back for him, but is dissuaded by her companions. 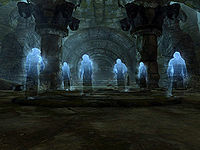 When you encounter the ghosts again near the end of the Labyrinthian Thoroughfare, Elvali will not longer be with them, with the others making her grim fate clear. Unused dialogue exists that provides a full recollection of Savos Aren's version of events during the expedition. At some point, he would have commented on Elvali's death, saying "Elvali died here. I don't even remember what killed her. One of the countless faceless horrors. I think she was glad, in that final moment. Hafnar was covered in blood, but his stupid Nord pride wouldn't let him admit defeat. I... I don't know why I pressed the others on, convinced them to keep going. "If we can just make it through, it'll all be worth it", I told them. And the fools believed the words I myself didn't trust." This page was last modified on 20 October 2017, at 10:08.